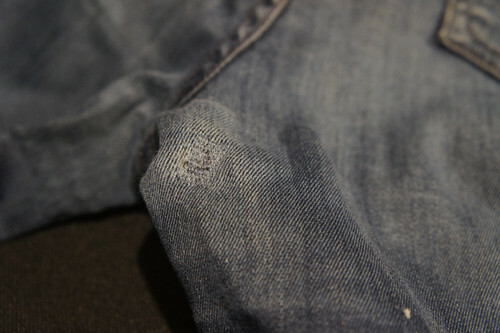 On Friday I posted about finding a hole in my favorite pair of jeans (and really the only ones that fit.) I had already started scheming to sew my own pair of jeans, and then I got some great comments explaining how the hole can be repaired. Seriously, people, I didn’t even know that was possible! I grew up in the 1970s, and I remember those iron-on patches. But, I didn’t realize that small holes can be repaired by machine and be fairly invisible. Thanks, sewing blogosphere! 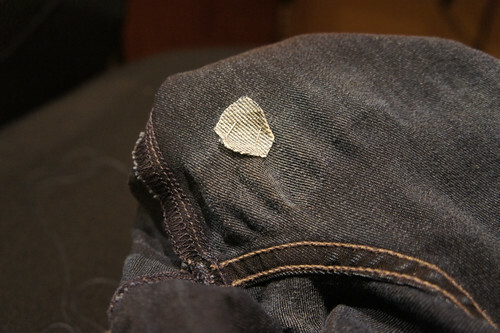 The commenters and other webpages I found about repairing holes in jeans suggested buying a jeans patch from a store like JoAnns. I was motivated to work on this late Friday, so instead, I found a ragged pair of my husband’s jeans (that I had saved for some reason, instead of donating), and cut a small piece. I even had some thread that matched relatively well. 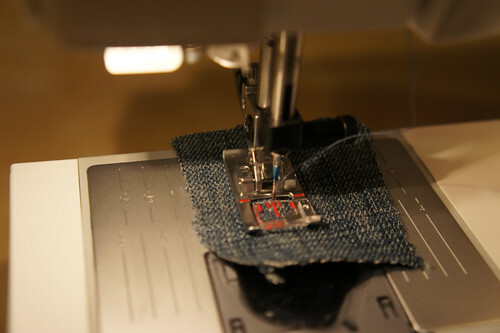 Then I practiced on a scrap piece of denim… my sewing machine has a “darning” stitch that I never knew how to use. And, finally, I just went for it, and completed the repair. 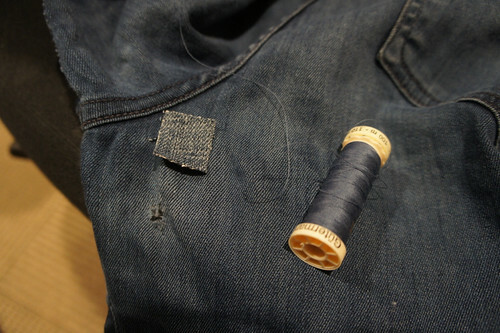 It’s not perfect (I should have thought more about the grain of the jeans and the visual ‘grain’ of the stitch….) but it’s unnoticeable while wearing. Really, the whole process took 20 minutes, tops.